Imagination is parents’ best friend when it comes to raising kids. Now, we all know there isn’t a manual to raise children. Although, after seeing some of these crazy things parents do you’ll wish there was one. Check out these funny and embarrassing situations so you know what not to do. 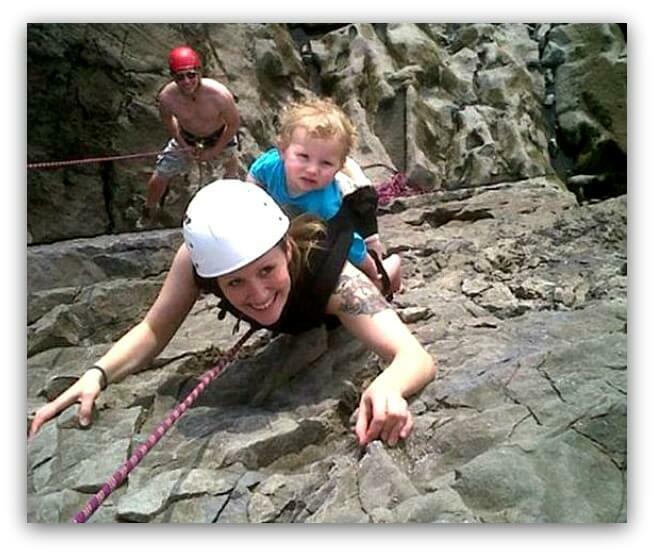 You’ll see everything from a baby scaling the side of a mountain to another one riding a real live crocodile. 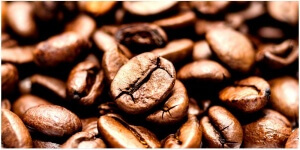 You may want to put down your cup of coffee or you may be at risk of spitting it out. Be prepared to laugh. Now as funny as all these pictures are if you’re not shocked by our number one pick then you’re made of stone. Here’s a hint…These parents want to teach their baby the sky is the limit. 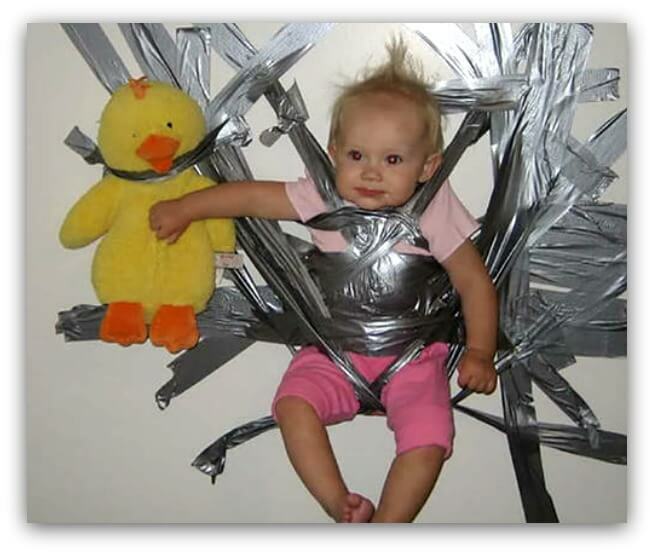 Duct tape is cheaper than a babysitter. If the baby starts crying, you can always tape a toy on the wall. Now they say that duct tape can be used to fix anything but this may be going a bit too far. What do you think? Never allow your husband to go shopping alone again. This is not the baby gate his wife put on the list. I bet this husband is going to be the one in the doghouse when his wife comes home. Look at this photo. Completely crazy, right? You wouldn’t get me up there and yet there’s a baby on her back. 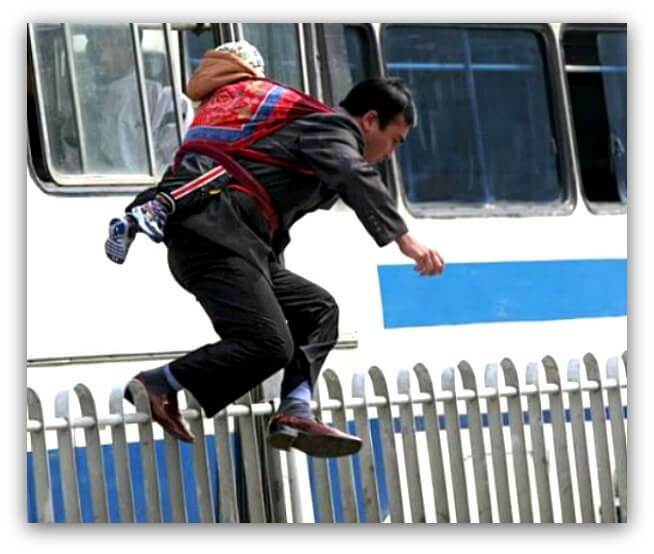 Now, what do you think… Is the crazy part she forgot his helmet or that he’s up there in the first place? It’s never too soon to start climbing, or is it? And BTW put a helmet on your kid. Kids can sleep anywhere, right? I don’t know whether to be jealous or feel sorry for the little guy. 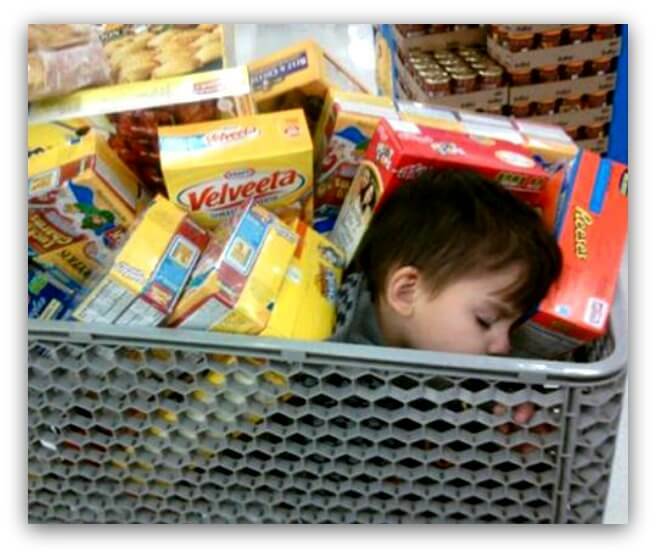 Looks like the Velveeta and Reeses makes a nice pillow. Ahh, to be this relaxed. 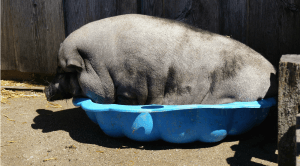 I decided… I’m jealous. How about you? Next up, is he destined to be a waiter? Well, maybe not a waiter but a table. When his wife told him to eat over a table, this is not what she meant. But he’s not breaking any rules, right? I guess, if it works, it works. Safety first, right? I’m not so sure this is so safe. Looks like they forgot something important… the car seat. The look on this baby’s face says it all. Next, this kid doesn’t want to wait until he’s 18. Can you guess what he wants to buy? I had to look twice to see what was in his cart. My kids used to love playing with shopping carts but this pushes it a bit too far. Don’t you think? I’m sure this made his father proud. 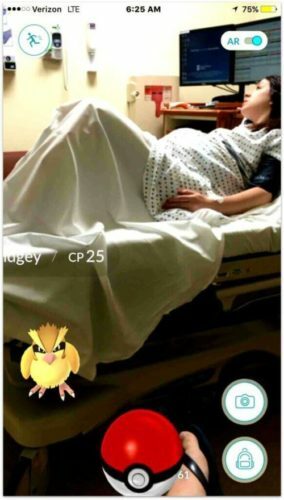 Luckily, he’ll have to wait 18 years. 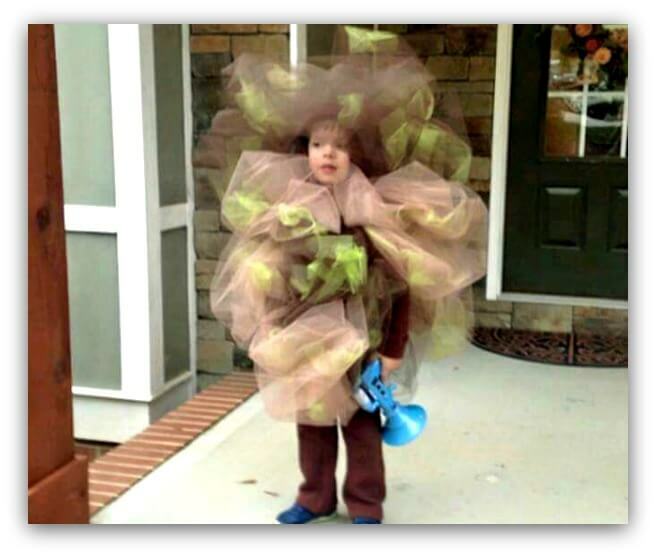 He’ll l be more careful next time he asks his parents for a “cool” costume. His parents thought a fart was a good idea. This kid didn’t see nor smell that coming. So what do you think… great costume or scar him for life? We’ve heard of shrimp on the barbie, but really? 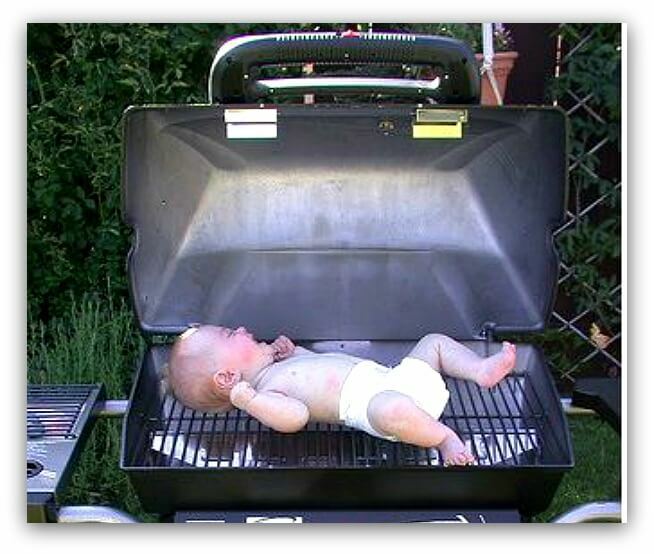 A baby on a barbecue is definitely a fail. Ride’em Cowgirl. Take a close look at this photo. What do you notice? The Alligators mouth is not taped. 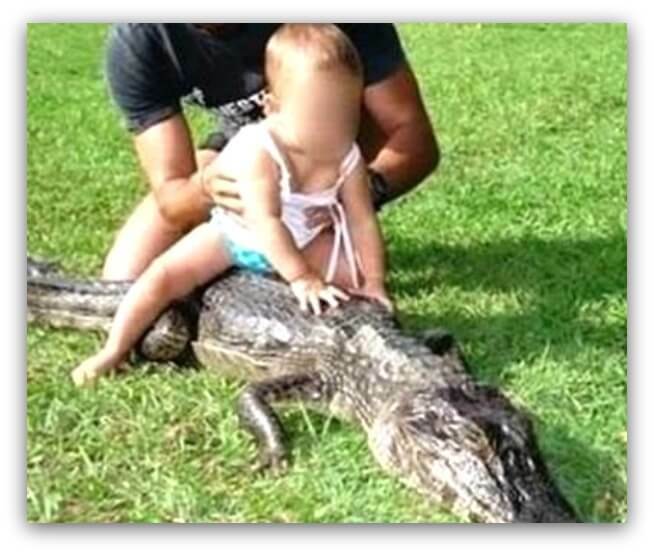 Now riding a gator is never a good idea but this… crazy. I’m sure when his wife told him to take her to the park, she didn’t have this in mind. So, your kids are tired after a long day. Do you give them a healthy snack? Maybe a piece of fruit? Even a candy bar to perk them up would be better than this. 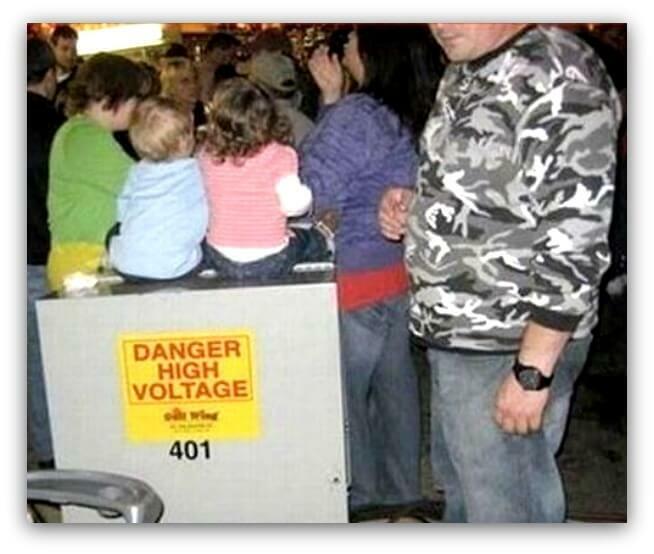 Notice to parents… If your kids are tired, it’s not a good idea to have them sit on a high voltage device. It won’t charge up their batteries. 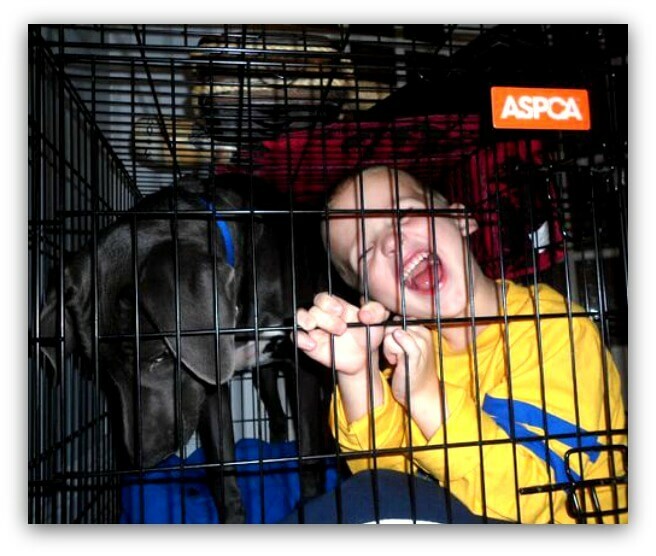 Next up, do you think this kid’s time out is cruel or brilliant? It looks somebody wasn’t a good boy. Did you make a mess again? By the way, we’re not talking about the dog. To be fair this little boy has a smile on his face. Looks like he’s having a bit of fun with his best friend. 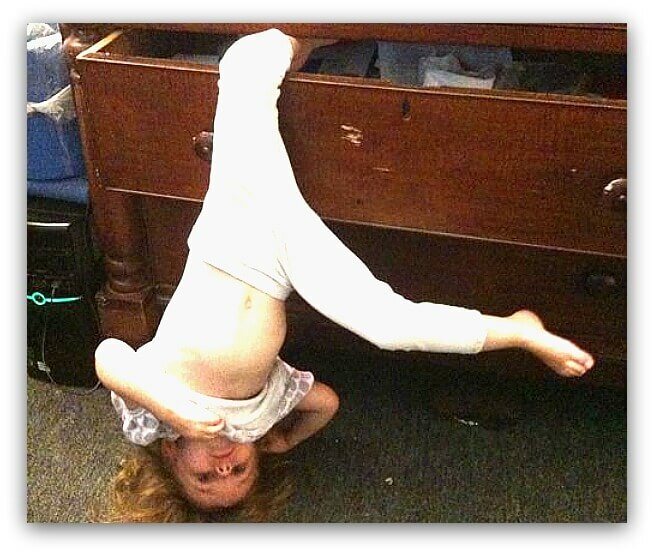 Note to parents everywhere… This is not how you put away the clothes. Step 1: Take the socks out of the dresser. Step 2: Help your little girl put her socks on. Wait, it seems somebody skipped step 1. When you have to go, you have to go, right? Perhaps you shouldn’t go with your kid on your shoulders. 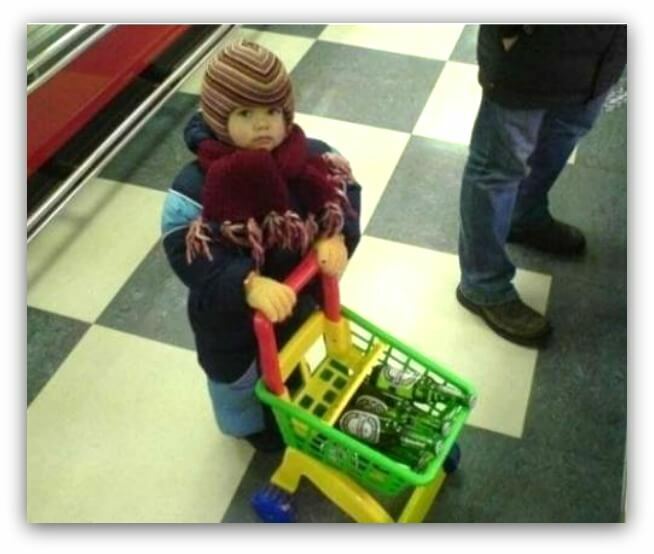 Genius move or parent fail… what do you think? Next up, A baby and a cooler. Can you guess where they put their baby? Now this is one cool kid, right? Who said coolers aren’t for kids? 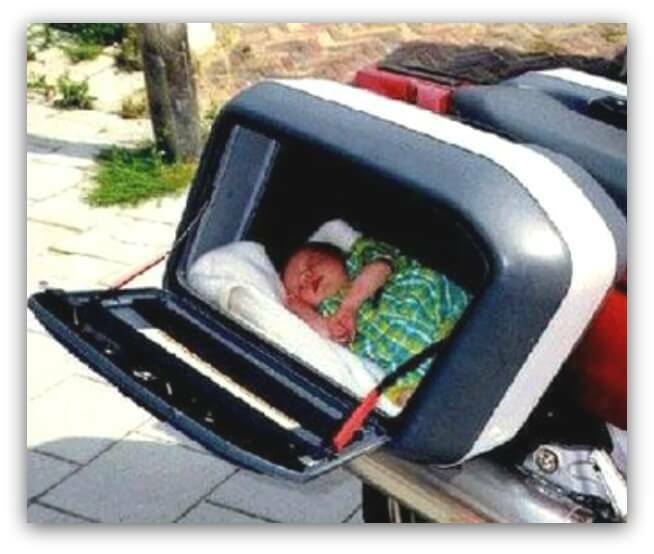 Coolers keep beers cold and your baby safe… maybe? I’d call this a clever idea but ultimately a fail. What do think? 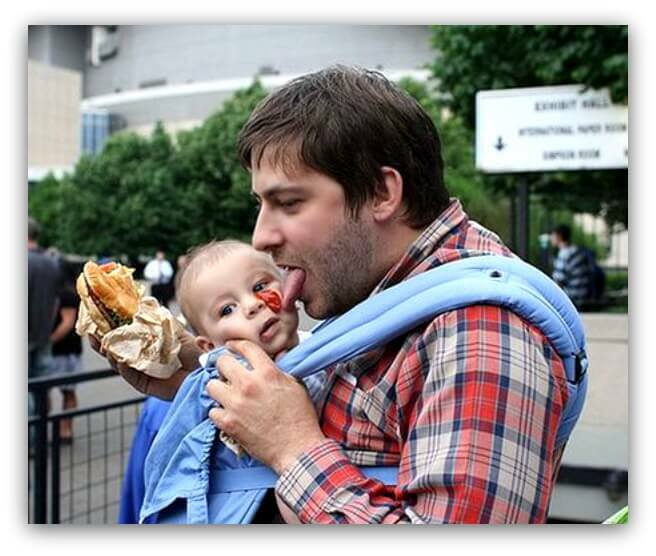 Who said dads can’t multitask? 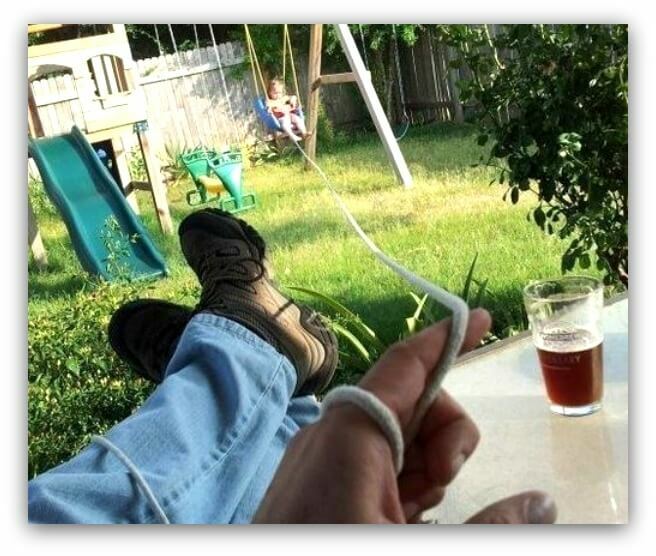 This dad is bonding with his daughter, having a beer and enjoying life at the same time. What do you think Mom will think about this? Next up, a baby and a cute kitty. What could go wrong? Not the cute little kitty cat you thought, right? We agree. 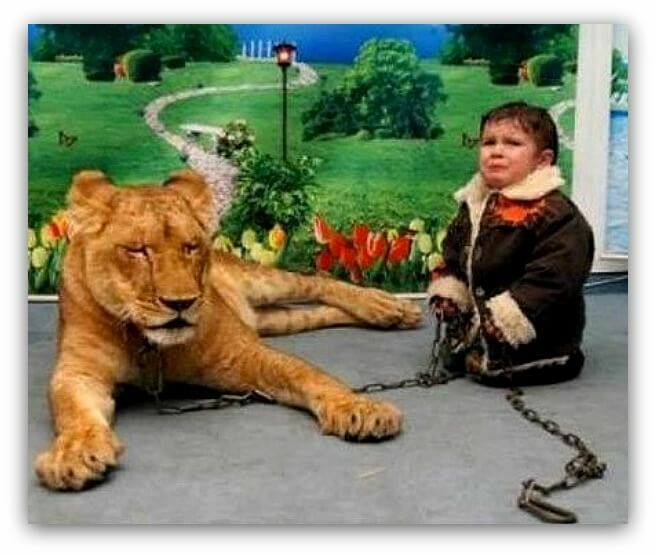 When is it ever a good idea to put your child next to the king of the jungle? We’d vote for never. Also, look how scared the poor little guy looks. This is a parenting fail at its finest. 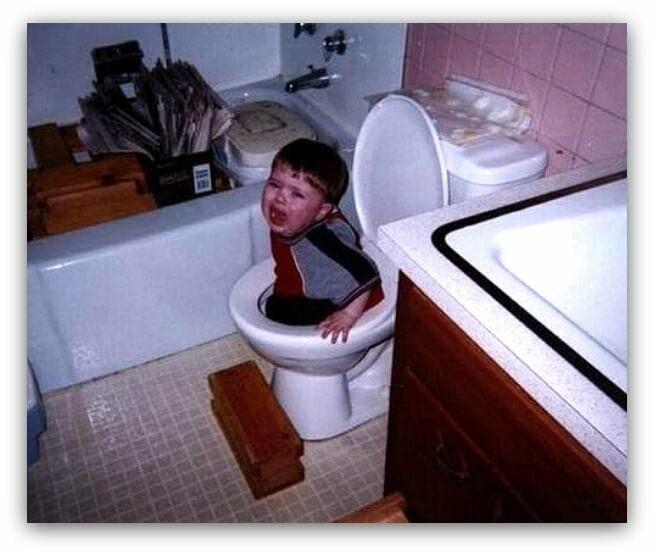 Did you forget to flush the toilet? We all know potty training can be difficult but this is crazy. Guess who we shouldn’t ask for potty training advice? This poor little guy is going to be traumatized and afraid of the toilet. They’ll be lucky if he’s potty trained before he heads off to high school. Who needs a table when you have a baby with a napkin on his head? I guess he’s keeping the kids head clean. That’s something, right? If it works, it’s not silly. Is this an environmental protest? It’s never too early to teach your kid about environment preservation, right? This cutie looks like an experienced treehugger already. 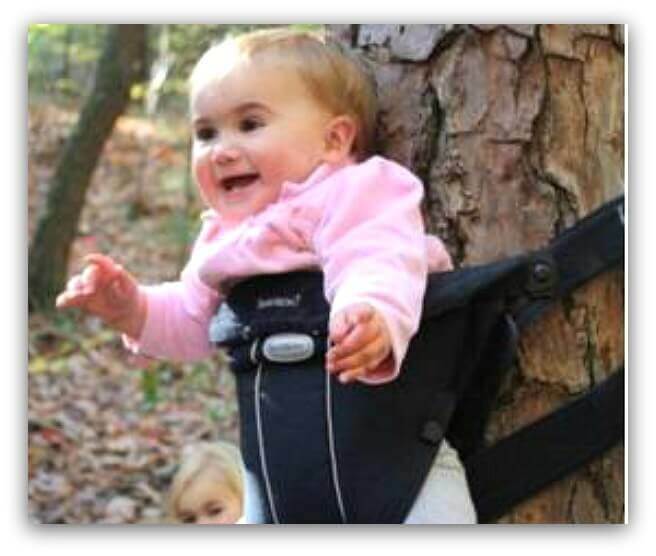 I’m pretty sure parenting 101 is not to hang the baby from the tree. This parent gave hooks a different concept. Duct tape is good for babies, but hooks are perfect for toddlers. 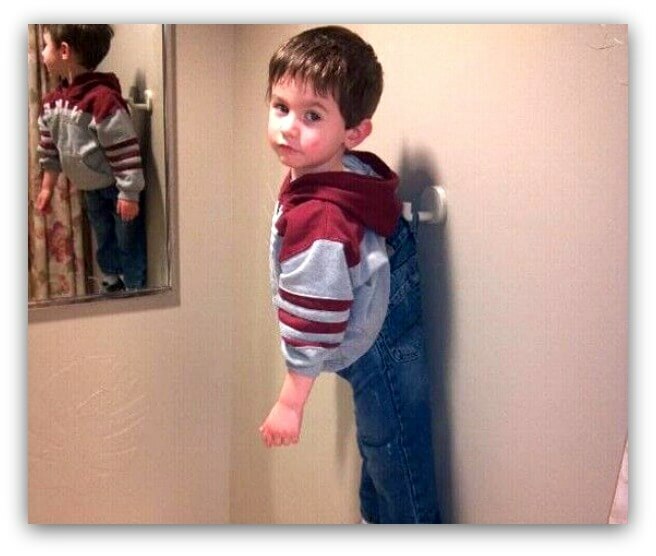 Notice to parents everywhere… hanging your child on a hook is not a time out. Yes, you’re seeing right. 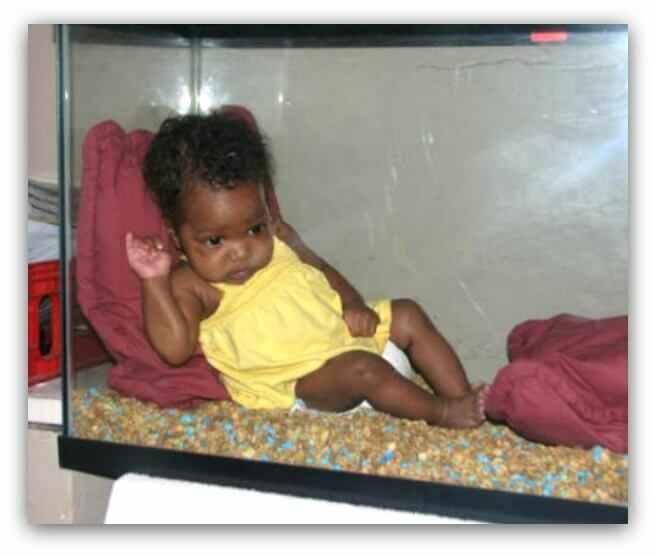 That’s a baby in a fish tank. She’s even sitting on the rough rocks at the bottom of the tank. 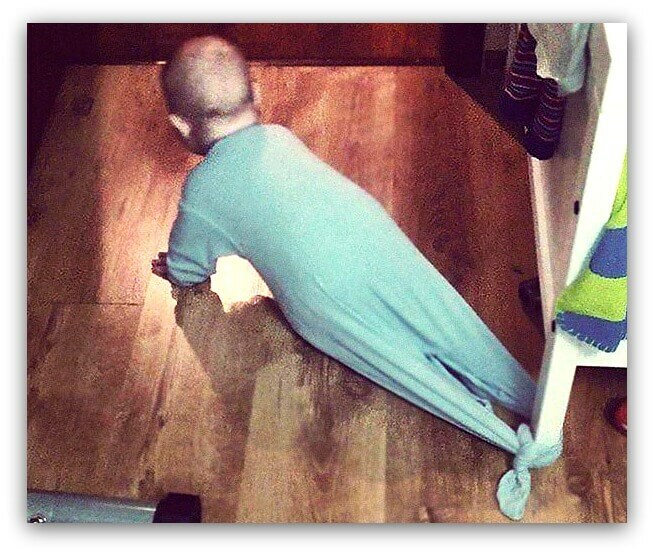 This is some crazy parents idea of a low budget baby gate. At least they were considerate enough to leave out the fish, right? 17. 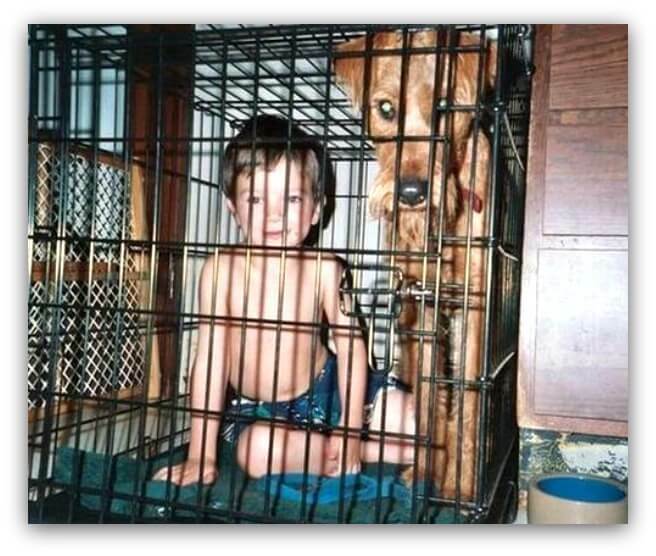 A Baby And His Cute Pet? 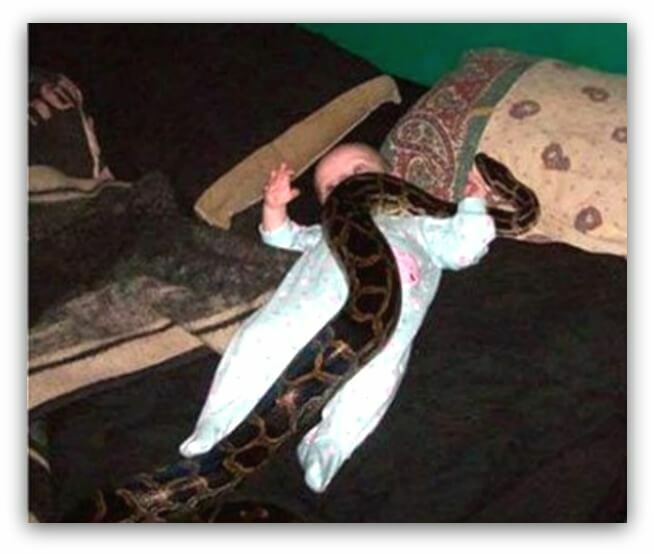 It’s important for babies to get exposed to animals. A dog, maybe a cat… heck even a cute hamster. But this…. no way! Look how big that thing is. It gives me chills even thinking about it. We’ve seen some weird things so far, right? And this certainly isn’t the worst photo we’ve seen. But for some reason, this one grosses me out. It looks this dad doesn’t know how to use a napkin. 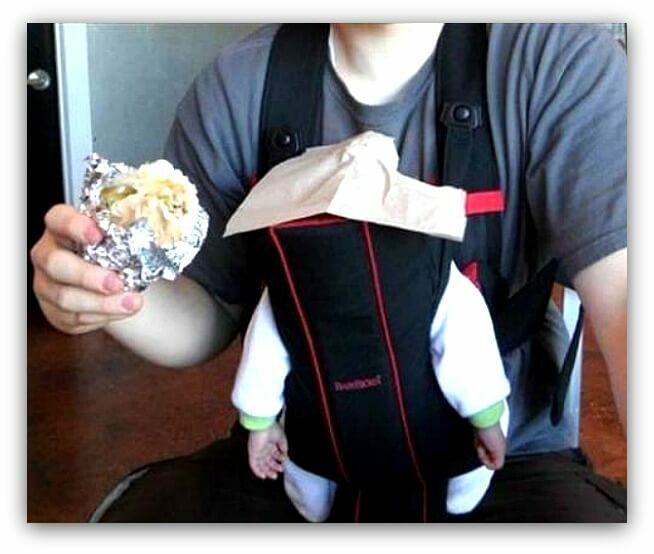 I guess the dad in our early photo, with the napkin on the baby’s head, had the right idea after all. Next, a baby and a blender. What could go wrong? What do you notice in this photo? Aside from the obvious. Go ahead and take a closer look. It’s still plugged in! 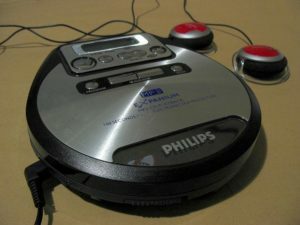 Now, we’ve all licked batter off at one time or another but… It wasn’t plugged in. Can we all say together… Fail. 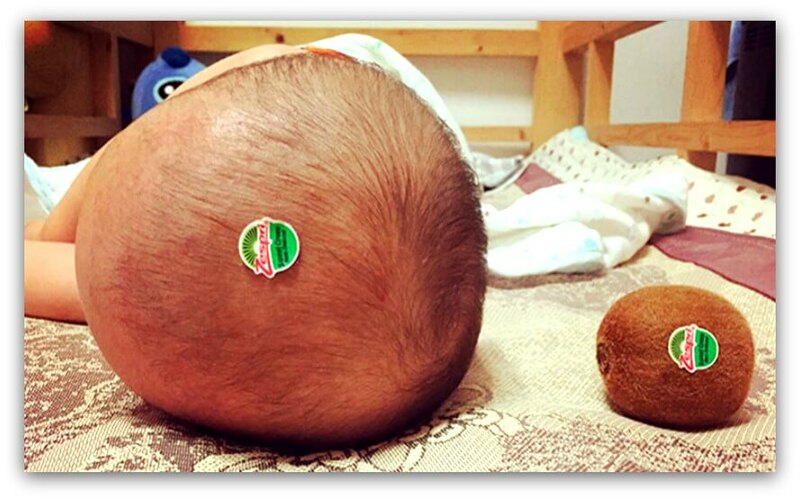 Babies find comfort in unusual places. It looks they are playing Twister in their dreams. This one was just too cute not to share. The soothing sounds of water. 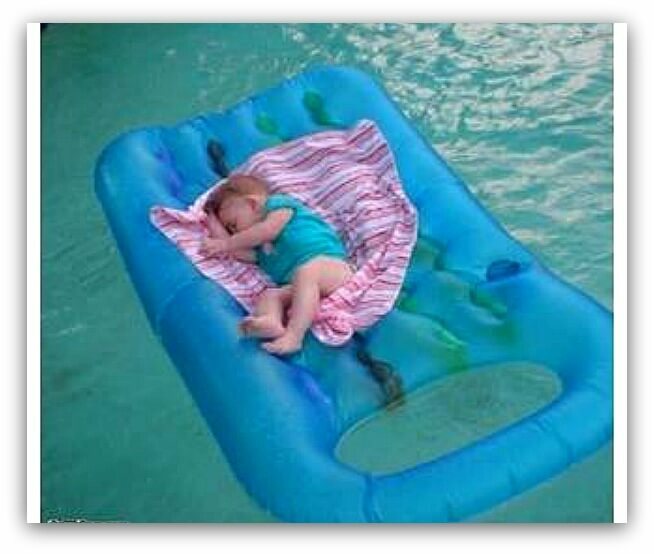 If your baby is relaxed , they fall asleep faster. It looks these parents took that advice too far. In reality, I’m jealous. This cutie looks so relaxed. A desperate parent will do anything to be on time. 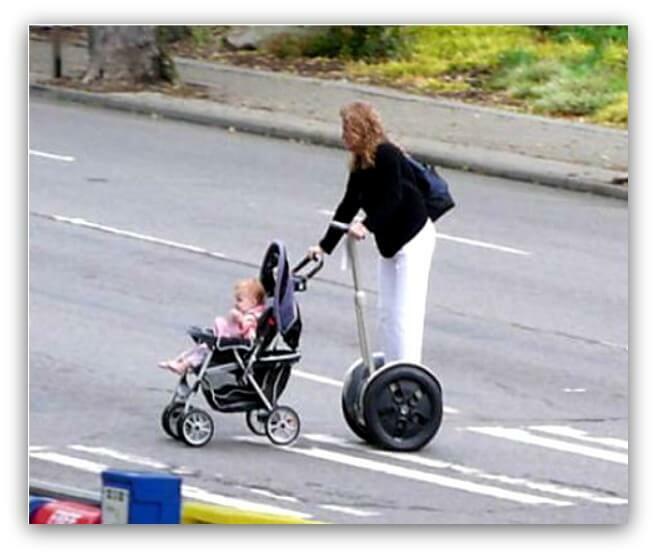 But a Segway? Really? How many fails do you see in this picture? Let’s start with the fact that they’re crossing a busy intersection this way. But this is not the only parent in a rush. Which is more extreme, this or our next photo? He’s athletic. We’ll give him that. You know things get real when you start doing Parkour with your baby to save time. This looks like an 8 on the danger level. This baby’s first words will be: “No pain, please”. At first glance, this looks creative. You get your workout done. You spend quality time with your child. 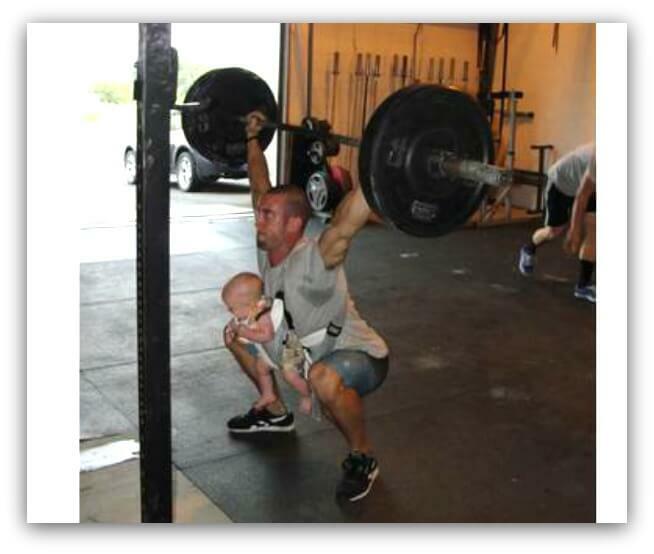 Then you think… what happens if he drops the barbell? 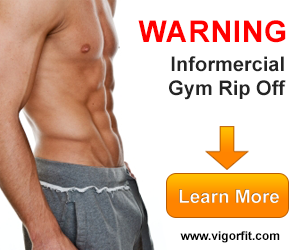 This is not a new workout craze… It’s just plain crazy. At first, hero and father of the year. Then only a second later… fail. In his defense, he just didn’t have enough arms. We give him points for trying. 8. Can You Spot The Difference? You want to avoid mix-ups at all costs. What do you do? Label things. 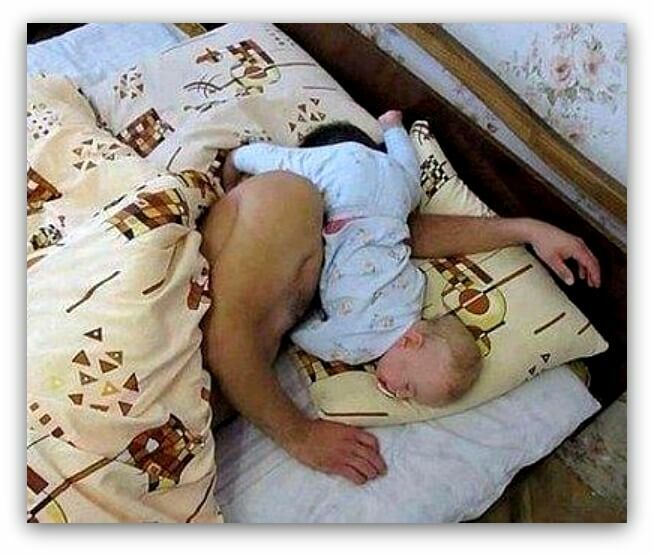 A father only needs his cellphone and his imagination to be a great babysitter. 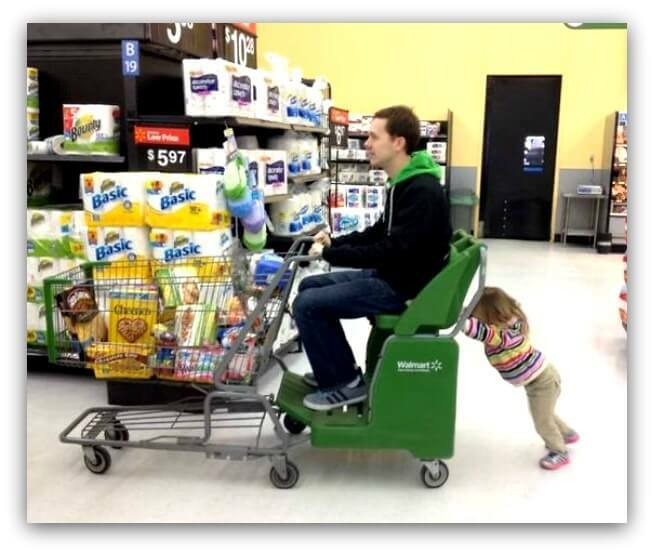 This parenting fail looks like a win to us. Very cute. 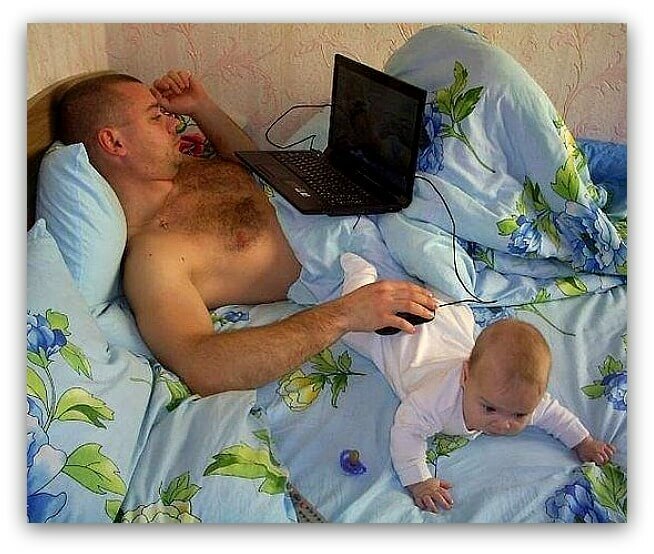 This father is using his baby as a mousepad. 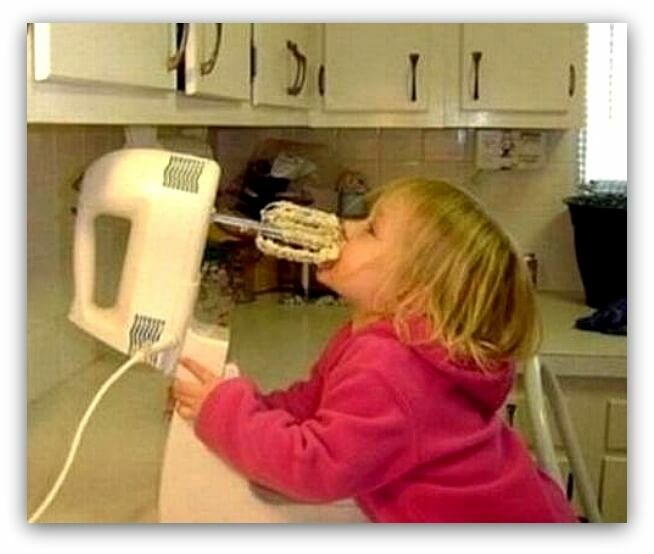 Multitasking skills at their finest or fail? What do you think? It’s a cute picture but pay attention to your baby, Dad. They grow up too fast. 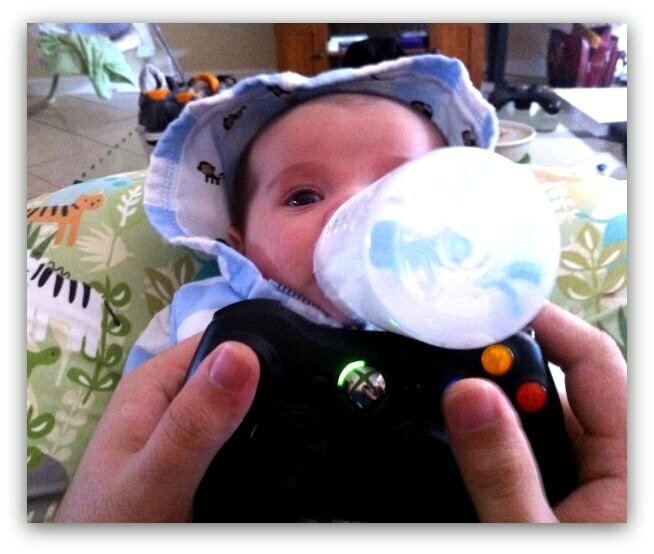 When you have a baby it is time to give up the video games? 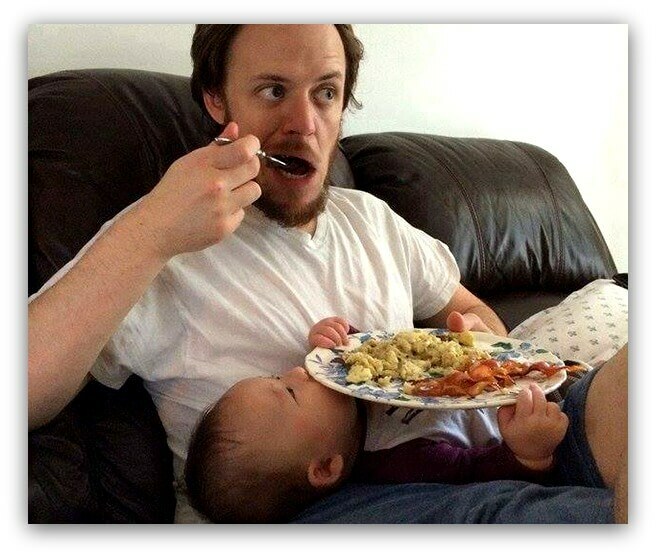 Not necessarily but don’t you think he could have at least paused it to feed his baby? Why do any of us have kids? To take care of us and do chores, of course. 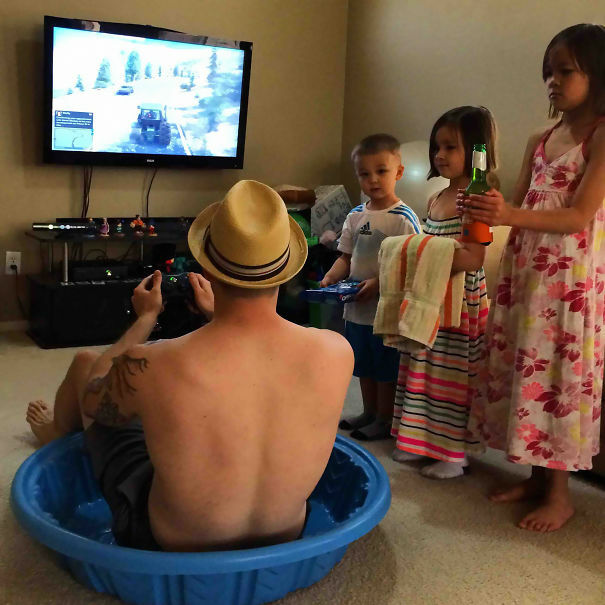 Who needs a vacation when you have three kids and a pool? The real question is how did he train them so well. Maybe he should write the manual we’ve been talking about. What do you think? 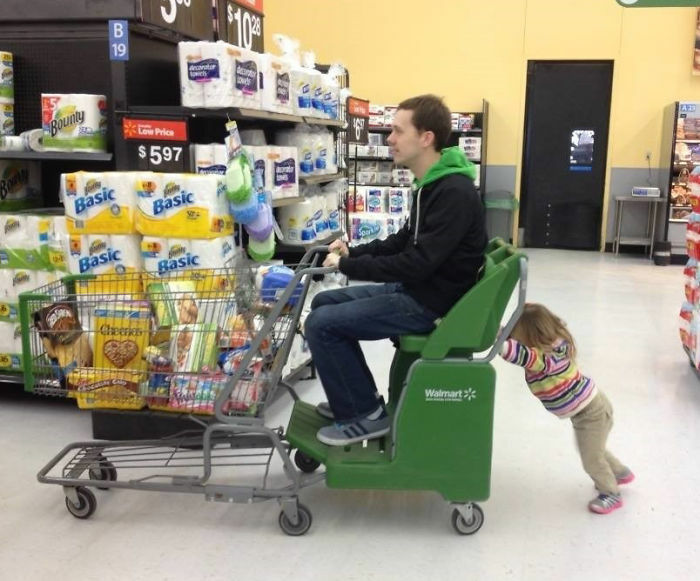 This parenting fail is a total win. Yes, he should be paying attention to the kids. Yes, he shouldn’t be napping. But aren’t we all secretly jealous of him? 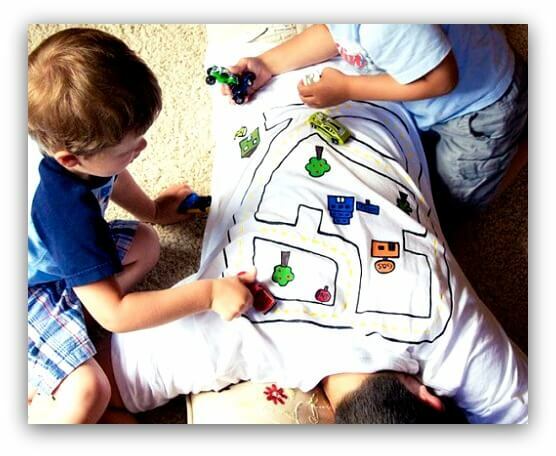 This daddy used a t-shirt, his kids, and lots of imagination to win father of the year. A strong parenting fail needs a strong daughter, right? That’s how this father sees it. Now we’ve all seen everything at Walmart. It might look ridiculous, but it works. Who do you think did it? I bet it was Daddy. We think if you have to tie your baby to the crib you’re doing something wrong. It’s a bird, it’s a plane. Wait, IT’S A BABY! These parents are the winners for best outdoor parenting fail. Take a close look at this picture. 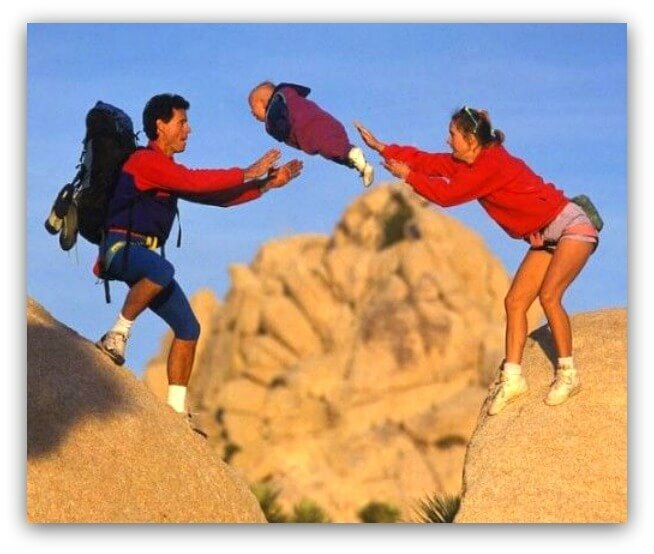 This baby is being thrown across a big crevasse on a mountain top. 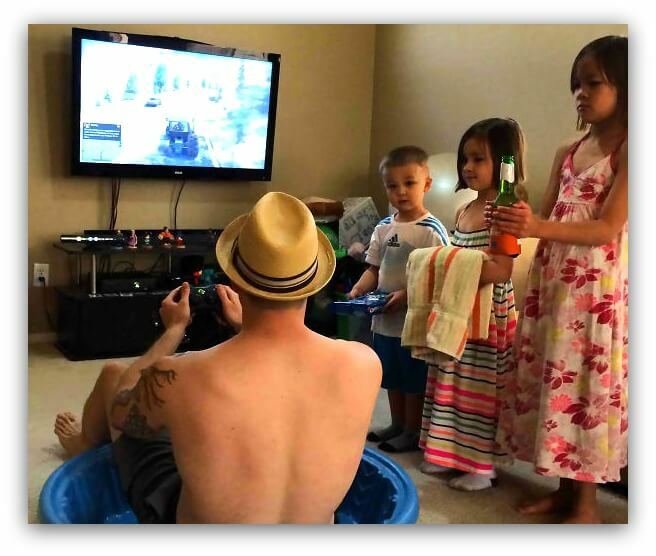 Meet our parents that won our number one parenting fail award. It’s going to be hard to beat this. What do you think?